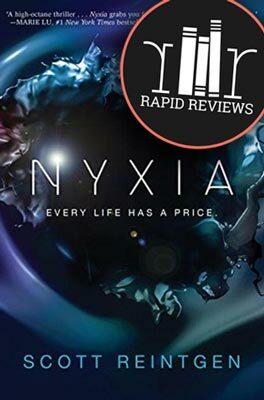 No spoilers in this rapid review of Nyxia by Scott Reintgen. I give it 3 stars. I was in the mood for a science fiction story, so I picked up Nyxia, the first book in The Nyxia Triad by Scott Reintgen. Nyxia is about Emmett, an underprivileged boy from Detroit, and nine other teens from around the world who have been recruited by communications giant, Babel. They will travel to Eden, a distant planet, known for it’s reserves of a valuable substance called nyxia. One thing is clear; Babel thrives on competition. The teenagers will compete during the year-long trip for their spot on the crew of eight that will descend to Eden. There are enormous cash incentives for the winners. What is not clear to Emmett, though, is why all the training? Why do they need to learn to fight? And why their young age? Will their age protect them from whatever is waiting? Emmett and his roommate attempt to uncover these mysteries, as they train to fight and to mine the nyxia. This book had many surprises that I enjoyed along the way. I was intrigued by Emmett and his background as well as the clashing of a wide variety of cultures. While not a religious story at all, there were many Bible references used throughout that I found fascinating–Babel, Eden, Adamites, Genesis 11, Genesis 12, to name a few. On the other hand, nyxia (the substance, not the book title) was a little fantastical to me. My buy-in to the premise of this science fiction novel was hindered a bit by its presence. I also think the end of this book could have been the midpoint of a longer novel. The flow and plot might have been more satisfying if there was more to this first installment. Have you read it? Let us know what you thought about Nyxia or if you plan to read it in the comments! No spoilers on this page, please! Ready to read Nyxia? Click to buy and help us pay for hosting! Or add at Goodreads. Oh and share this with your friends who might be interested in a review of Nyxia.